Its easy to see why some of Englands most famous painters were inspired by Suffolks picturesque villages and unspoilt coastline. THORPENESS, ALDEBURGH AND RIVER DEBEN CRUISE: Thorpeness is a fairytale village full of quirky buildings. Onto the pretty coastal town of Aldeburgh, with its unspoilt beach dotted with fishermen's huts and charming historic high street. In the afternoon we enjoy a cruise on the River Deben, within the Suffolk Coast and Heaths AONB. 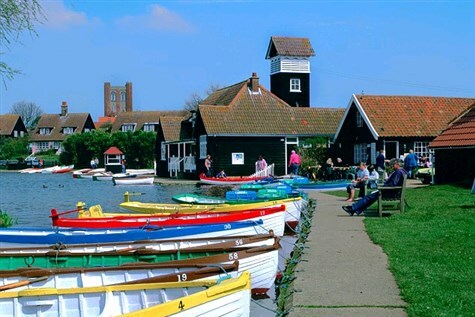 CONSTABLE COUNTRY AND FELIXSTOWE: Be inspired by the picturesque villages associated with the artist John Constable, with visits to Dedham and East Bergholt.Felixstowe is a charming Edwardian seaside town with vibrant town centre and fine architecture. LAVENHAM AND BETH CHATTO GARDEN: We travel to the chocolate box village of Lavenham, the finest medieval village in England, built by the wealthy wool merchants of Tudor times. In the afternoon we visit the Beth Chattto Garden, which the ten times Chelsea gold medal winner created from scratch more than 50 years ago. Situated close to Colchester, all rooms have TV, telephone, hairdryer and hospitality tray. The hotel has a cocktail bar, lounge and leisure facilities include swimming pool, sauna, steam room and gym. There is no lift but rooms are on the ground and first floors.